I have been pregnant twice, eleven years apart, and let me tell you age makes a huge difference in how you feel and how your body reacts to the pregnancy. 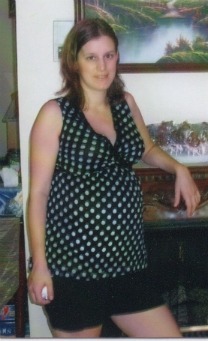 I was 18 during my first pregnancy and 30 during my second, both were very different experiences. Staying fit and bouncing back to my pre-pregnancy shape was much easier when I was 18 as compared to 30. After my first pregnancy I literally went back to my pre-pregnancy weight by 2 weeks postpartum without exercise or dieting. My second pregnancy took me 6 weeks to get back to my pre-pregnancy weight which by contrast was just as much as weighed when I was 9 months pregnant the first time, and it took me 2 years to get back to the weight I wanted to be. Staying fit and healthy during pregnancy is easier said than done. Trying to take care of yourself while also protecting your baby can be a struggle, if you eat too healthy or exercise too intensely people look at you like you are doing something wrong, possibly risking a miscarriage or depriving the baby of nutrients just to stay slim. When I had my first child 14 years ago my doctor’s told me not to exercise (running, lifting weights), they told me just to walk but nothing more intense or strenuous, and at 18 I just listened. I managed to stay slim and look healthy but my behavior at that time far from healthy. I should have been eating nutritious items like fruits, veggies, whole grains and lean proteins, but instead I just ate junk food and a lot of it. Cakes, candy, fast food, ice cream….wherever my cravings took me I ate it, nutritiously speaking my diet was poor and unhealthy. Only by sheer luck and a great metabolism did I maintain a healthy weight while consuming an unhealthy diet without any exercise. My pregnancy was uneventful except for the occasional migraine but I did experience a pretty rough labor lasting over 16 hours. The end result was a beautiful, healthy baby girl that weighed 7 lbs 13 oz. During my second pregnancy I was 30 and actually starting at the same weight I was when I was 9 months pregnant with the first. This pregnancy I knew I wanted to be healthier and take better care of myself. Pregnancy is not a free for all: you actually only need 300 extra calories a day which amounts to an extra snack, pregnancy does not mean you can give into every craving without putting on a massive amount of weight and strain on your body. Optimal weight gain is between 20-30lbs and my goal for the pregnancy was not to gain more than 30 lbs. I also wanted to remain fit, so with the advice of my OB I continued weight training and walking (instead of running because my heart rate went too high when I ran) while keeping my heart rate at 140 bpm or less. This time around my labor was much easier and shorter, 4 hours compared to 16 and I felt like I bounced back pretty quickly considering my age. By the time I was cleared to exercise at 6 weeks postpartum I was already back to my pre-pregnancy weight through healthy eating and breast feeding definitely helped in that department. Once cleared I resumed a weight training and running program, exercising while the baby napped. I know it is not easy to eat healthy and get back into an exercise routine when you have an infant that needs constant attention and keeps you up all night but rest assured by adding some type of physical activity you will not only feel more energetic but you will also feel better about yourself overall. My second daughter Abby screamed constantly and would not go to sleep unless you pushed her in the stroller, so although when she was first born it was too cold to take her outdoors, I used to do squats and lunges while I rocked the stroller back an forth. Sneaking in little bits of exercise throughout the day is better than none at all. As a new mom you need to fit in exercise where you can and don’t beat yourself up too much if you can’t, there will most definitely be days you are just too exhausted, but always make sure you take time for yourself because you deserve it and need it to stay sane. My youngest daughter is now 2 1/2 and I am finally at my “happy” weight and the healthiest I have been in many years. It took me a good 2 years to get where I am completely comfortable with my body after having my second child and that’s okay. Don’t feel pressured to get back to your “ideal” weight in 3 months, everyone is different and some people will shape up quicker than others. Don’t compare yourself to anyone, just do the best you can and know that your body has given you one of the greatest gifts in life…your child, the rest will fall into place in time. You can read more about healthy living by visiting Toni’s blog at Running, Loving, Living: the road to my dreams. You can also follow Toni on Twitter and Facebook!